The summit convened on Monday [Sept. 14] by François Hollande was, in his words, "one more step" in the international mobilization against the Islamic State. Even so, not everything has been decided on, notably in regard to the military operation to be conducted against the jihadists…. . If all the world agrees that the eradication of the Islamic State also involves Syria, the question remains no less thorny, because an intervention in that country, unlike in Iraq, happens to require the agreement of its regime. It was a conference on "peace and security in Iraq." François Hollande wanted to make it an "important step" in the international mobilization against the Islamic State. 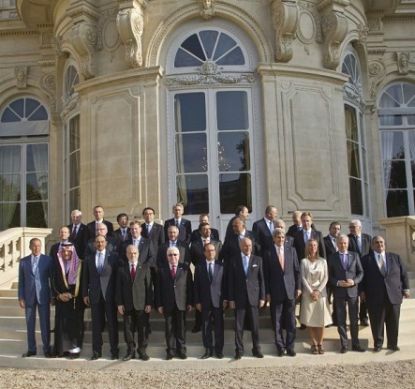 The summit in Paris on Monday of about 30 countries ended with a declaration of ten very general principles, which above all confirm that support for Baghdad against the jihadists may be "military." Certain of the questions tackled on Monday, however, have not been responded to publicly. When will the intervention be? "There’s no time to lose," said François Hollande as he opened the conference in Paris. From its base at Al-Dhafra in the United Arab Emirates, France carried out its first reconnaissance flights over Iraq with its Dassault Rafale fighter aircraft. The objective: identify priority targets to attack. 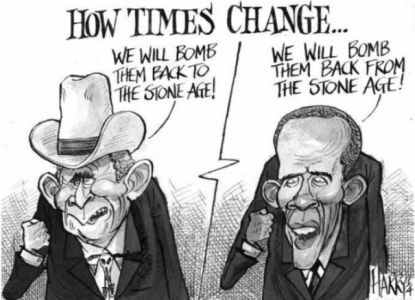 The modalities of intervention for each state have yet to be defined by the United Nations. A meeting of the U.N. Security Council is scheduled for Friday [Sept. 19], but the timing of the air strikes is no more precise. Neither did Barack Obama, in presenting his strategy for fighting the jihadists in Iraq and Syria, provide more details. "We will not announce our operations in advance," explained an American official. Who will carry out the strikes? The international coalition in Iraq will not resume the security dimension of its role, and not all of the countries will participate in the strikes against jihadist positions - far from it. This role is primarily vested in the United States, which began its air strikes on August 8. They will soon be assisted by France. More hesitant, the United Kingdom has been slow to take a similar decision. After the announcement last weekend of the Islamic State's execution of a British hostage [David Haines], David Cameron assured that he is prepared to "take all further steps necessary" without making any concrete announcement. Both Canada and Australia have confirmed they are sending men to provide intelligence or military advice in Iraq and the region. Other countries, such as Germany and Italy, have committed to deliver arms and humanitarian aid or finance the rebuilding of the Iraqi army. This is one of the principal points of disagreement between Washington, which wants to expand its strikes to Syria, and Paris and London, who are more reticent. If all the world agrees that the eradication of the Islamic State also involves Syria, the question remains no less thorny, because an intervention in that country, unlike in Iraq, happens to require the agreement of its regime. An intervention with an international framework here is therefore unlikely, because Russia and China continue to block any resolution at the U.N. Security Council. What's more, in Paris on Monday, the head of Russia's diplomatic mission, Foreign Minister Sergei Lavrov, let it be known that Bashar Al-Assad’s regime and similarly Iran (which was significantly absent from the Paris conference) are "natural allies in the fight against the Islamic State." Neither does France herself want strikes in Syria to reinforce Damascus. François Hollande therefore took care not to mention this question in his speech, asking rather for reinforcement for the "forces of the democratic opposition" by "all means." How to cut off supplies to the Islamic State? In their final declaration, the countries participating in the Paris summit expressed their determination to take "necessary measures" to address the "sources of recruitment and financing" of terrorist groups, including the Islamic State. They recalled Resolution 2170 adopted last month by the U.N. Security Council which condemned "any engagement in direct or indirect trade involving" these groups, notably in the oil sector, "which could constitute financial support." Among the measures envisaged include asset freezes and travel bans on individuals associated with these movements. "Many stressed this morning (Monday) the need to dry up funding for this terrorist group, and a conference will shortly be organized to this end on the initiative of our Bahraini friends," specified [Foreign Minister] Laurent Fabius. This is a very sensitive issue, the Islamic State having certainly profited from financial support from the Gulf States who now support the international coalition in Iraq. Last week, the head of American diplomacy, John Kerry, notably pointed his finger at the patronage coming from Qatar and Kuwait. But the jihadist group, which today controls a fortune estimated at over €1 billion, is equally financed by ransom money paid to free hostages. On this matter, even Barack Obama has taken issue with France, confiding to The New York Times this weekend that "Hollande … says his country does not, when in fact it does," thus contradicting the official position of French diplomacy.